This ist he switching system of the old Stratocaster (Vintage) which was standard until the mid 1970s. 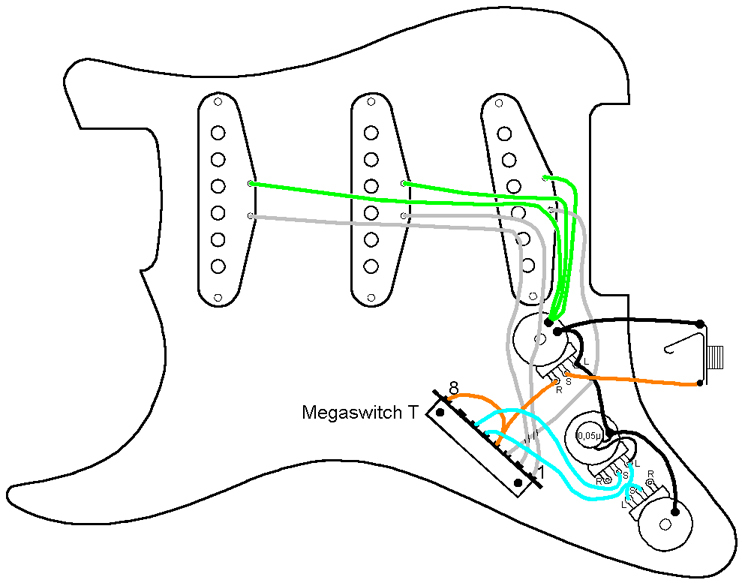 For selecting the three single coil pickups, a three-position switch is required, such as the Megaswitch T. The neck and middle pickup have one tone control each; the pickup on the bridge has none. This pattern can be changed if required. All three pickups have the same magnetic polarity which means that undesirable buzzing isn’t a problem in any of the switching positions. Note: The two tone controls can be configured in reverse simply by unsoldering the connections and reconnecting them elsewhere. If a tone control is required on the bridge pickup for example, this must be connected via connection 7. 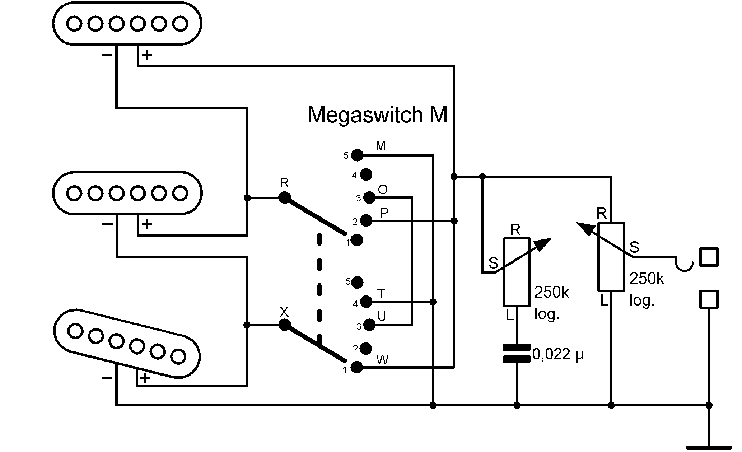 This is the new Stratocaster standard switching system which was introduced in the mid-1970s. 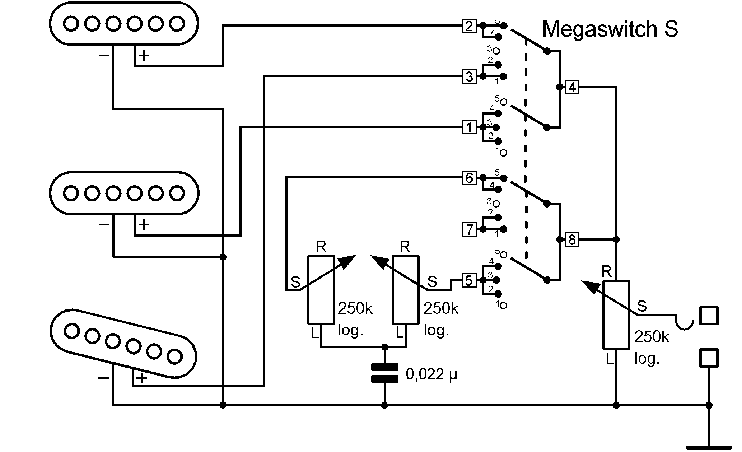 Many guitarists at that time realized that quite interesting sounds were obtainable in the spaces between the existing switching systems so-to-speak, where two neighboring pickups operate simultaneously. As a result, the three-position switch was replaced by a new five-position version. The tone controls were assigned as they had always been, i.e they remained unchanged. For this reason, both function in position 4. The Megaswitch S is ideal for this application. In principle, the wiring ist he same as for the SSS1. To enable buzz-free playing in positions 2 and 4 at least, the middle pickup must be magnetically reverse-poled and wound in the opposite direction similar to the two outer pickups. Here too, it is possible to assign tone controls in a range of ways. The combinations neck-plus-bridge and all-three-together cannot be obtained using a standard switching device. The neck-plus-bridge is extremely popular as it has a similar sound to a Telecaster. Some guitarists build an extra switch into their guitars to achieve this configuration. This is not necessary, however. 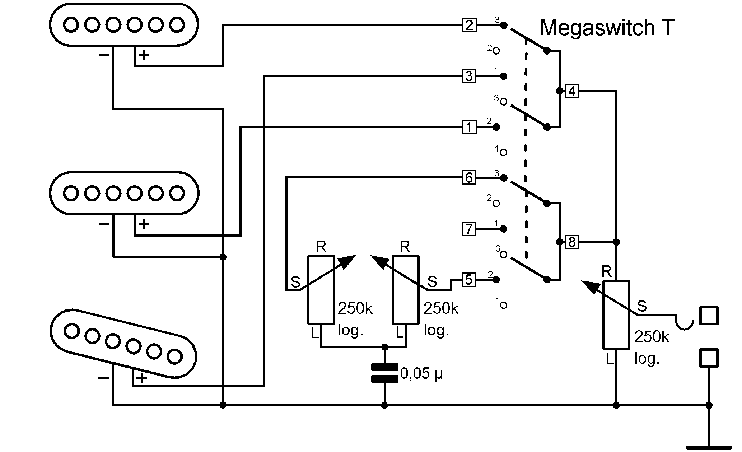 It is much more easily obtained using the Megaswitch E. Positions 1, 2, 4 and 5, offer the usual sounds whereas in position 3, instead of the middle pickup, the neck-plus-bridge configuration is produced. When the magnetic orientation of the pickups is S-N-S or N-S-N, the positions 2 and 4 are buzz-free. If a buzz-free sound in position 3 is required, the neck and middle pickup can be exchanged which results in buzzing in position 2 however. It is also possible to create a buzz-free sound in position 3 by assigning the middle and the bridge pickup, which results in buzz in position 4. This is another version of the SSS2 and the SSS3. The connections and resultant sounds in positions 1, 2, 4 and 5 the same as usual. In position 3 however, the bridge and neck pickups are switched in series. This creats a fuller, softer sound than parallel switching. 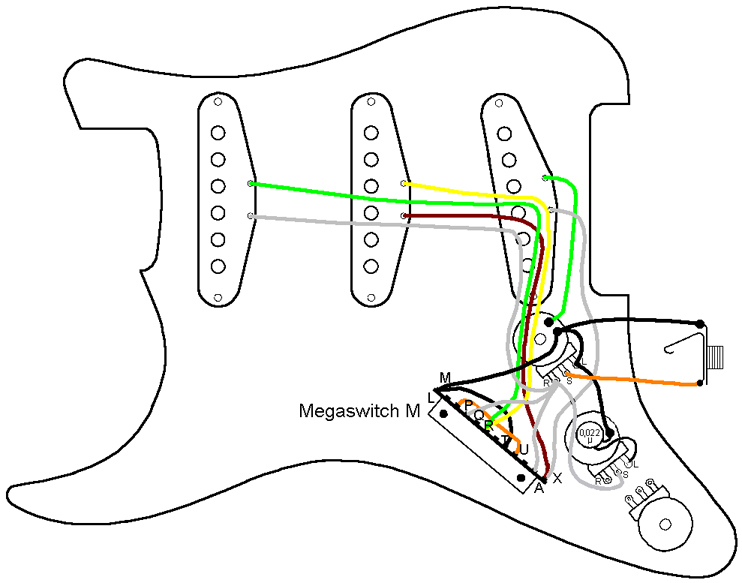 This configuration requires the Megaswitch M. It is advisable here to connect the two tone controls to the neck and bridge pickups. If a reduction in the high frequencies is required in position 3, both tone controls must be adjusted accordingly. When the magnetic orientation is S-N-S or N-S-N, positions 2 and 4 are buzz-free. 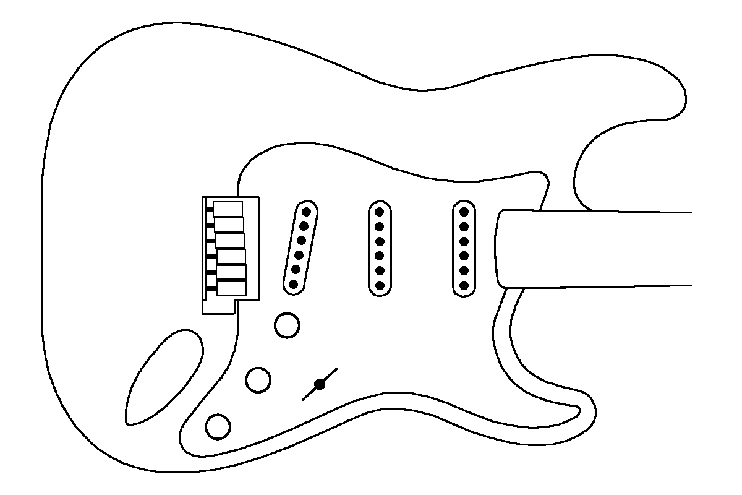 If a buzz-free sound is required in position 3 however, this can be obtained by exchanging the neck and the middle pickups, which in turn results in a buzzing sound in position 2. A buzz-free sound can also be obtained in position 3 by exchanging the middle and bridge pickups, which makes position 4 buzz. 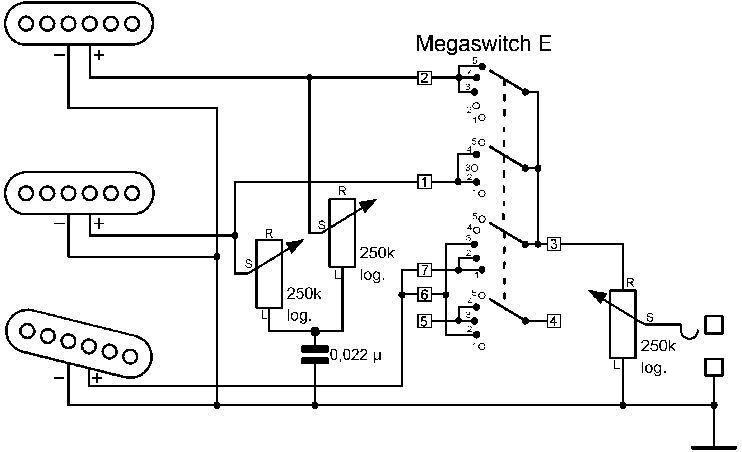 This version enables a number of configurations, including three different switching-in-series positions. Position 1: Bridge pickup only. 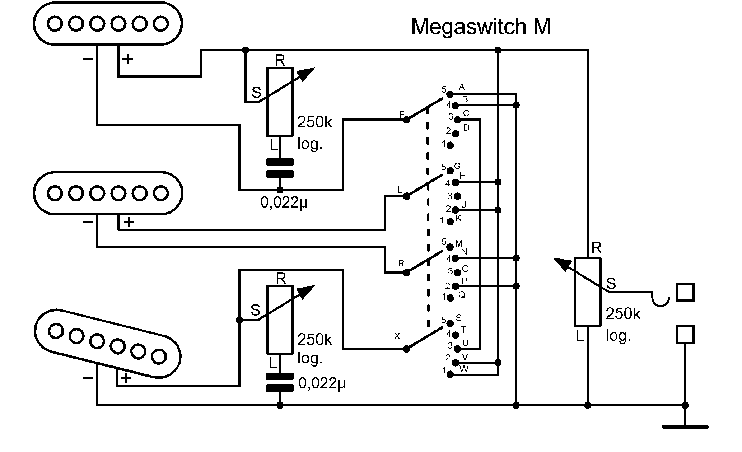 This configuration range requires the Megaswitch M. When the connections between O und U are not made, all three pickups are switched in series in position 3. Just one tone control is advisable here. The following magnetic orientation creates a buzz-free sound in positions 2 and 4: S-N-S or N-S-N. When a buzz-free sound is required in position 3, the neck and middle pickup should be exchanged, which in turn creates buzz in position 2. 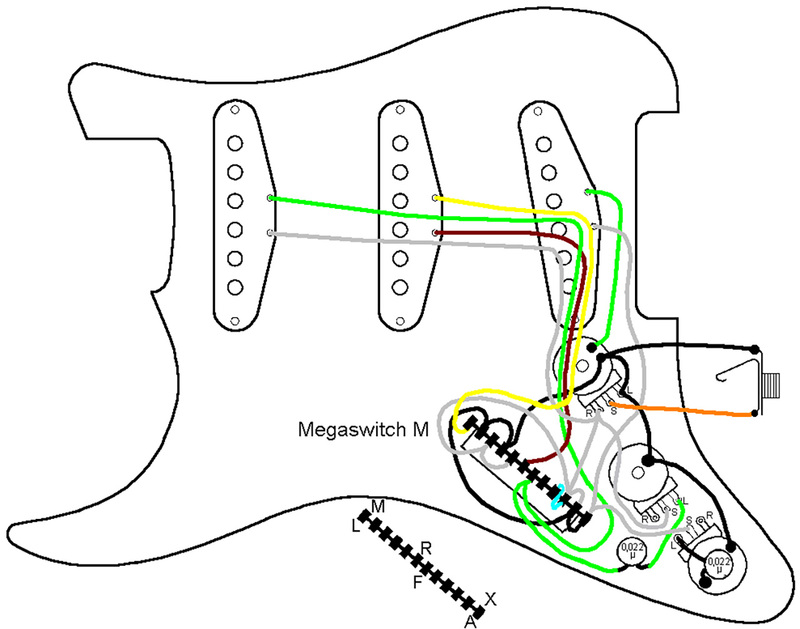 Another solution is to exchange the middle and bridge pickups which creates buzz in position 4 however.